Concerning Bill's attitude to energy with eliminated carbon (dioxide), CO2, he should consider the geological past of our planet: the tropical climate was definitely not caused by human-made carbon (dioxide),CO2, because the humans have not yet existed. The tropical climate had to be caused by other factors, perhaps by volcanic carbon dioxide, but also by methane from ocean floor, swamps etc., and/or by increased Sun activity. A British company http://intelligent-energy.com has developed an always available electricity source for charging USB devices, such as mobiles, notebooks etc.. One may order it at about 150€ in the U.S.A.
Fujitsu Laboratories has developed a technology that detects a person's pulse by measuring variations in the brightness of the person's face caused by the flow of blood. It is based on the characteristic of blood hemoglobin, which absorbs green light. It requires no special hardware and can measure pulse rate simply by pointing a camera at a person's face for as little as five seconds. It also automatically chooses moments when the person's body and face are relatively still to minimize the effects of irrelevant data on measurements. This technology has a wide range of potential uses, including health monitoring and maintenance as well as security applications. Details of this technology will be presented at the 2013 General Conference of the Institute of Electronics, Information, and Communication Engineers, opening March 19, 2013, in Gifu, Japan. The OPERA neutrino experiment at the underground Gran Sasso Laboratory has measured the velocity of neutrinos from the CERN CNGS beam over a baseline of about 730 km with much higher accuracy than previous studies conducted with accelerator neutrinos. The measurement is based on high-statistics data taken by OPERA in the years 2009, 2010 and 2011. Dedicated upgrades of the CNGS timing system and of the OPERA detector, as well as a high precision geodesy campaign for the measurement of the neutrino baseline, allowed reaching comparable systematic and statistical accuracies. An early arrival time of CNGS muon neutrinos with respect to the one computed assuming the speed of light in vacuum of (60.7 plus or minus 6.9 (stat.) plus or minus 7.4 (sys.)) ns was measured. This anomaly corresponds to a relative difference of the muon neutrino velocity with respect to the speed of light (v-c)/c = (2.48 plus or minus 0.28 (stat.) plus or minus 0.30 (sys.)) X 10^-5. CERN says a neutrino beam fired from a particle accelerator near Geneva to a lab 730 kilometers away in Italy traveled 60 nanoseconds faster than the speed of light. Scientists calculated the margin of error at just 10 nanoseconds, making the difference statistically significant. But given the enormous implications of the find, they still spent months checking and rechecking their results to make sure there were no flaws in the experiment. "We have not found any instrumental effect that could explain the result of the measurement," said Antonio Ereditato, a physicist at the University of Bern, Switzerland, who was involved in the experiment known as OPERA http://operaweb.lngs.infn.it/?lang=en . The scientists involved didn’t just accept the results, however. The most likely explanation for the super-fast neutrinos is some kind of error in the system. The team checked everything, but turned up no mistakes, which now means they are throwing it open to the wider community and asking what could have caused this anomaly. If no explanation is found, then we may have just seen proof of faster than light travel. For the moment, the team at CERN and Gran Sasso are keeping their minds open to both possibilities, but expecting that some kind of error will be found. The Fermilab in Chicago team had similar faster-than-light results in 2007, but those came with a giant margin of error that undercut its scientific significance. Now, John P. Costella (Melbourne, Australia) explains why the statistical calculation is wrong (click). Because a tachyon moves faster than light, we cannot see it approaching. After a tachyon has passed nearby, we would be able to see two images of it, appearing and departing in opposite directions. The black line is the shock wave of Cherenkov radiation, shown only in one moment of time. This double image effect is most prominent for an observer located directly in the path of a superluminal object (in this example a sphere, shown in grey). The right hand bluish shape is the image formed by the blue-doppler shifted light arriving at the observer—who is located at the apex of the black Cherenkov lines—from the sphere as it approaches. The left-hand reddish image is formed from redshifted light that leaves the sphere after it passes the observer. Because the object arrives before the light, the observer sees nothing until the sphere starts to pass the observer, after which the image-as-seen-by-the-observer splits into two—one of the arriving sphere (to the right) and one of the departing sphere (to the left). Aerogel is not like conventional foams, but is a special porous material with extreme microporosity on a micron scale. It is composed of individual features only a few nanometers in size. These are linked in a highly porous dendritic-like structure. This exotic substance has many unusual properties, such as low thermal conductivity, refractive index and sound speed - these properties cause its exceptional ability to capture fast moving dust. 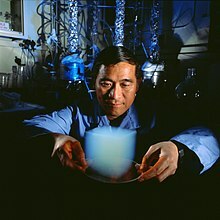 Aerogel is made by high temperature and pressure-critical-point drying of a gel composed of colloidal silica structural units filled with solvents. Jet Propulsion Laboratory (JPL) prepared and flight qualified aerogel. JPL also produced Aerogel with well-controlled properties and purity for the Mars Pathfinder and Stardust missions. This particular JPL-made silica aerogel approaches the density of air. It is strong and easily survives launch and space environments. JPL aerogel capture experiments have flown previously and been recovered on Shuttle flights, Spacelab II and Eureca. ABSTRACT: The conversion of CO2 to valuable compounds, which is considered as an effective approach to solve the global warming, represents a great challenge due to the high stability and low reactivity of CO2. Thermodynamic calculations predicted the feasibility of exothermic reactions between CO2 and Li3N into two important solid materials—carbon nitride and lithium cyanamide. Furthermore, the feasibility was confirmed by experiments, namely, the fast reaction between CO2 and Li3N produced crystal lithium cyanamide and amorphous carbon nitrides. This provides a novel process to control CO2 emissions.